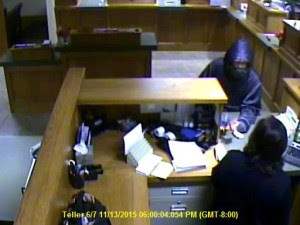 On 11/13/15 at about 6:00 PM, sheriff’s deputies responded to a bank robbery that just occurred at the El Dorado Savings Bank on Pleasant Valley Road in Diamond Springs. The suspect reportedly fled on foot, last seen running east on Pleasant Valley Road. The robbery took place at closing time when employees were locking the doors. 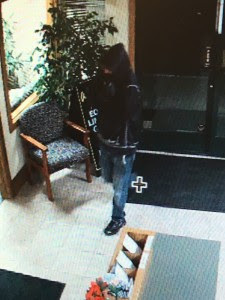 The suspect, described as a white male adult with his face covered, entered the bank, walked up to a teller demanding money stating he had a gun. After a brief argument, the robber went behind the counter, took money from one of the teller stations and fled. No one was hurt in the robbery and no gun was seen. 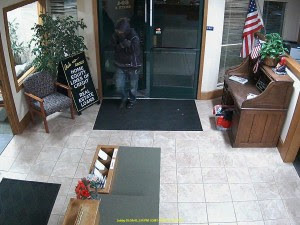 The suspect was described as a white male adult, about 25 to 28 years old, between 5’ 8” and 6’ tall, with a thin build. He had light brown/blonde curly hair wearing a grey or blue knitted hat and scarf, a dark colored heavy winter jacket with white piping around the shoulders and waist area, blue jeans, and black tennis shoes with white writing on the sides. The male had a mole on his right cheek under his right eye and had difficulty pronouncing the “s” sound when speaking. Deputies and CHP helicopter H20 canvased the area and surrounding businesses but the suspect was not located. Anyone with information regarding this crime, please contact the El Dorado County Sheriff’s Detective Bureau at (530) 621-4703.